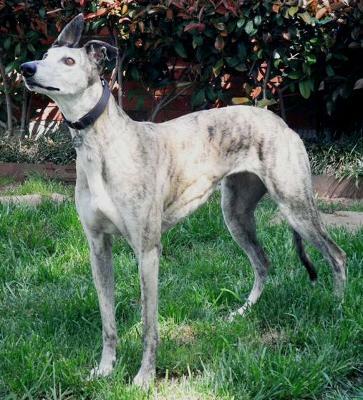 History: Tippi ran 67 races according to Greyhound Data. She was then retired to be a brood matron. 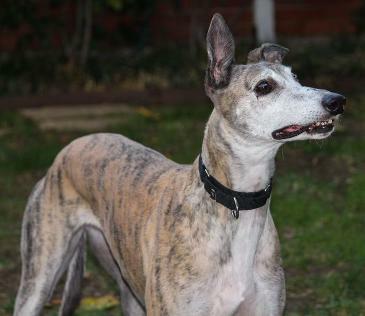 Greyhound Data show that she had one litter of pups, but she also had a litter of pups with sire, Nita’s Wild Bill (TAGS’ own Billy) which are not individually registered with the NGA. 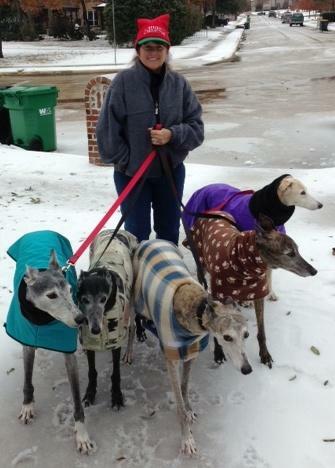 Tippi (in the middle) with her new fur-family, Snoopy, Chloe, Ashton and Bella and human mom, Marjy. Tippi knows beauty when she see it. 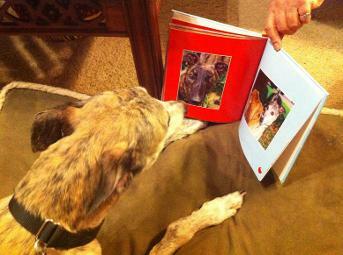 She's looking at Strider's and her picture in the book, TAGS Greyt Hounds. October 10, 2016 update: Tippi went to the Rainbow Bridge. Tippi ruled her household and will be greatly missed by her fur brothers and sisters and human family. 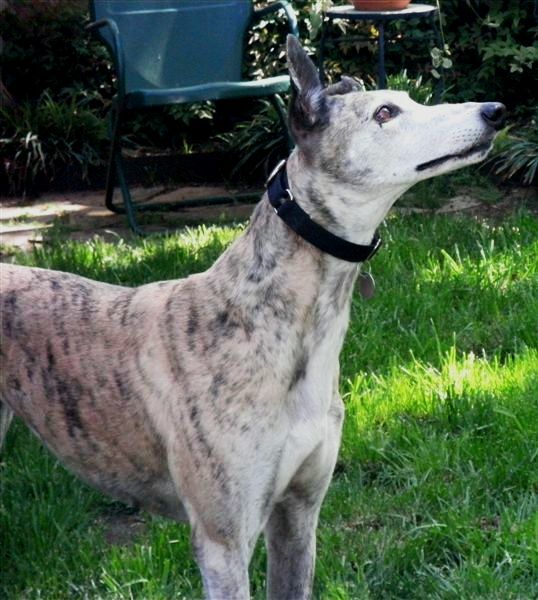 February 22, 2014 update: Tippi, was adopted to her forever home with the LaGesse family and four other Greyhounds. Congrats to Tippi and her new family! February 14, 2013 update: Tippi, named for the missing tip of one ear, is a sweet, loveable, cuddle bug who never met a stranger, including children. Once, when I had a repairman come to my house, I put the three dogs outside until I found out if the repairman liked dogs. 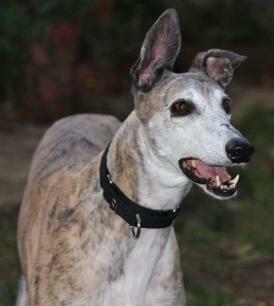 When I let them in, she raced in first (unusual, as she always lets my other Grey have that honor) and galloped to the room where the repairman was starting to work. Fortunately I had warned him that she was super-friendly and he spent a few minutes petting her while she was obviously very happy to see him. Although she doesn’t even try to get on the furniture or my bed, she’s the first one to greet me in the morning with a charming wiggle and fiercely wagging tail. Her coat is soft as velvet and she has several favorite places on her neck and belly where she will happily give you access for scratching. She has wonderful manners and patiently waits while I serve my other two dogs their meals first. I either feed her in her crate or a gated room so that my other dogs won’t disturb her while she finishes last. 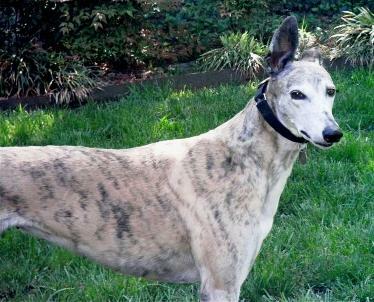 She gets along great with both my 4 year old female Greyhound (Sasha), and my 15 ½ year old, 35 lb, male Beagle mix (Barney). However, it’s important to note that she does not like strange dogs in her face (and is decidedly not cat tolerant). It took a short while to slowly introduce her to my other fur babies and now she plays like a puppy with Sasha, running together in my backyard. She still prefers the company of humans over dogs, so I think she might be good as an only dog as well as in a home with other dogs. Tippi does not like to have her nails clipped so it’s a two person job or should be done at the vet’s office. After the first paw, she nervously but patiently submits to the rest. 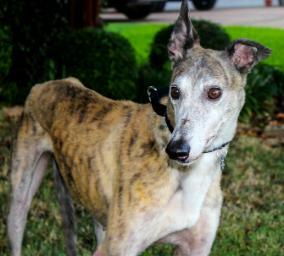 I hope someone very special takes Tippi into their hearts and give her the loving forever home she deserves. August 8, 2012 update: I thought I would wait a while for Tippi to adjust to home life before updating her bio – but there’s not much adjustment to it. She jumped on the bed and was immediately instructed to get down – oh well, it was worth a try. She was curious about what was on the kitchen counter and was immediately corrected – oh well, that didn’t work either. She wants to see what you are eating but understands when you tell her no. That’s it. She’s a dream. Tippi has had no accidents in the house. She eats her food and goes outside as soon as she’s finished. She sleeps through the night on a dog bed. She loads into the car (you don’t even have to ask her – just open the door). She plays with toys (she loves the noise) but doesn’t destroy them (and shares with the other dogs). She walks well on a leash. She stops by periodically to get a pet, but most of the time she reclines on a dog bed. She quietly follows me from room to room. Tippi is very much a lady. 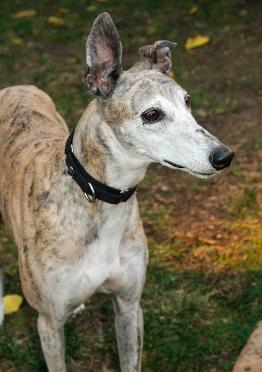 She’s a joy to have around and will be happy in almost any forever home (as long as there are no cats). 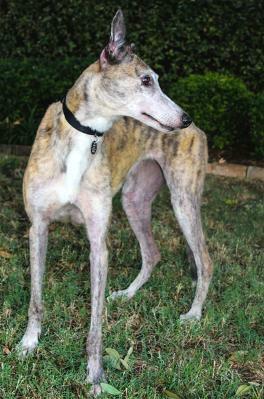 July 21, 2012 update: Tippi came to TAGS to find her loving lifetime home.